Manufacturing employment is on a long term decline, in the USA and the world. The massive increases in productivity allow fewer and fewer people to produce more and more good. This is a good thing as it allows us to afford more good with less cost. But it does mean fewer manufacturing jobs, which are very good jobs, exist. This is a shame but something we shouldn’t anticipate changing. Believing we will globally, or in the USA, return to the huge number of manufacturing that were available previously jobs is not a wise conclusion to reach. Certainly there can be short term fluctuations that lead to increased jobs – that has happened in the last year for example. The most surprising thing to me about this graph is how stable employment was through 2000. From 1980 to 2000 the most common idea was the USA no longer manufactured anything. This idea was wrong, as I have written about previously: Chart of top 15 countries manufacturing output over time (2009) – Top 10 manufacturing countries in 2006. But I did think employment declined more from 1970 to 2000. One factor in this perception is that the number of employed people in the USA has continued to grow. So even remaining somewhat stable from 1970 to 2000, as a percentage of the labor force the jobs kept shrinking. The more important factor that played on people emotionally is factories being shut down got much more attention in the news than new jobs being added. So the perception was tons of jobs were being lost and none were being gained. Bain’s billions of profits were not rewards for capitalist creation; they were mainly windfalls collected from gambling in markets that were rigged to rise. So the vast outpouring of LBOs in recent decades has been the consequence of bad policy, not the product of capitalist enterprise. I abhor the subsidies provided to those that saddle corporations (that build up value through decades of hard work by employees) with huge debt. The actions of leveraged by out firms are atrocious. They seek to pretend that business is once again the land of the amoral behavior, as the robber barron’s sought to convince society of long ago. Those that saddle corporations (that have an obligation to those that built them up) with huge debt are despicable. Those same despicable people then take huge amounts of cash (for themselves) from the debt they saddled the corporation with. Quite a few smart people have figured out how to pay congress to allow those smart people to take huge profits out of businesses. By being smart enough to have congress create laws to allow their behavior they can say it was just doing what the law allowed. When you conspire with the authorities to create a system to drain cash from legitimate businesses into your pocket you can claim you are acting legally (if you do so by having them change the law, instead of having them just ignore the existing laws). But what is being done (for decades by both parties) by those we continue to elect to allow this behavior shows just how corrupt the system is. It is sad we allow those politicians who payoff those that give them large amount of cash, at the expense of our society, to remain in office. But we don’t even discuss the issues in any significant sense. Those using this cronyism and corruption know they are continuing to be given the open door to continue their very destructive ways. These are smart people. They know how to use public apathy and rhetoric to keep from discussing the important issues. It is going to take us to stop the corrupting cronyism that has taken over our political parties. The Curious Cat Investing, Economics and Personal Finance carnival is published monthly with links to new, related, interesting content online. 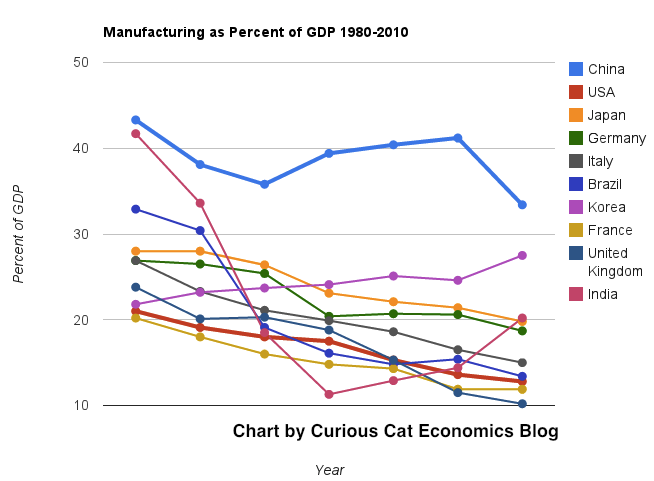 This chart shows manufacturing output, as percent of GDP, by country and was created by the Curious Cat Economics Blog based on UN data. You may use the chart with attribution. The 12 stock for 10 years portfolio consists of stocks I would be comfortable putting into an IRA for 10 years. The main criteria is for companies with a history of large positive cash flow, that seemed likely to continue that trend. Since April of 2005 the portfolio Marketocracy* calculated annualized rate or return (which excludes Tesco) is 7.1% (the S&P 500 annualized return for the period is 5.4%). Marketocracy subtracts the equivalent of 2% of assets annually to simulate management fees – as though the portfolio were a mutual fund – so without that (it is not like this portfolio takes much management), the return beats the S&P 500 annual return by about 370 basis points annually (9.1% – 5.4%). And I think the 370 basis point “beat” of the S&P rate is really under-counting as the 200 basis point “deduction” removes what would be assets that would be increasing (so the gains that would have been made on the non-existing deductions in the real world – are missing). Tesco reduces the return, still I believe the rate would stay above a 300 basis point advantage. The current marketocracy results can be seen on the Sleep Well marketocracy portfolio (the site broke the link, so I removed the link). The unemployment rate decreased to 7.8%, and total nonfarm payroll employment rose by 114,000 in September, the U.S. Bureau of Labor Statistics reported today. The change in total nonfarm payroll employment for July was revised from +141,000 to +181,000, and the change for August was revised from +96,000 to +142,000. Thus, with this report 200,000 new jobs were added (114,000 + 40,000 + 46,000). The unemployment rate declined from 8.1% in August to 7.8% in September. For the first 8 months of the year, the rate held within a narrow range of 8.1 and 8.3%. The number of unemployed persons, at 12.1 million, decreased by 456,000 in September. The number of long-term unemployed (those jobless for 27 weeks or more) was little changed at 4.8 million and accounted for 40.1% of the unemployed. This remains one of the most serious problems – along with the less that strong job creation numbers (since the too-big-too-fail financial crisis kicked off the great recession). In 2012, employment growth has averaged 146,000 per month, compared with an average monthly gain of 153,000 in 2011. 150,000 is decent but because of the huge job losses in the 4 years prior to 2011 there is a big recovery needed. Adding above 225,000 jobs a month, for years, would be a good result and put the economy on much firmer ground. Health care added 44,000 jobs in September. Job gains continued in ambulatory health care services (+30,000) and hospitals (+8,000). Over the past year, employment in health care has risen by 295,000. The average workweek for all employees on private nonfarm payrolls edged up by 0.1 hour to 34.5 hours in September. The manufacturing workweek edged up by 0.1 hour to 40.6 hours, and factory overtime was unchanged at 3.2 hours. The average workweek for production and nonsupervisory employees on private nonfarm payrolls was unchanged at 33.7 hours. In September, average hourly earnings for all employees on private nonfarm payrolls rose by 7 cents to $23.58. Over the past 12 months, average hourly earnings have risen by 1.8 percent. In September, average hourly earnings of private-sector production and nonsupervisory employees increased by 5 cents to $19.81. The largest manufacturing countries are China, USA, Japan and then Germany. These 4 are far in the lead, and very firmly in their positions. Only the USA and China are close, and the momentum of China is likely moving it quickly ahead – even with their current struggles. The chart below shows manufacturing production by country as a percent of GDP of the 10 countries that manufacture the most. China has over 30% of the GDP from manufacturing, though the GDP share fell dramatically from 2005 and is solidly in the lead. Nearly every country is decreasing the percentage of their economic output from manufacturing. Korea is the only exception, in this group. I would expect Korea to start following the general trend. Also China has reduced less than others, I expect China will also move toward the trend shown by the others (from 2005 to 2010 they certainly did). For the 10 largest manufacturing countries in 2010, the overall manufacturing GDP percentage was 24.9% of GDP in 1980 and dropped to 17.7% in 2010. The point often missed by those looking at their country is most of these countries are growing manufacturing, they are just growing the rest of their economy more rapidly. 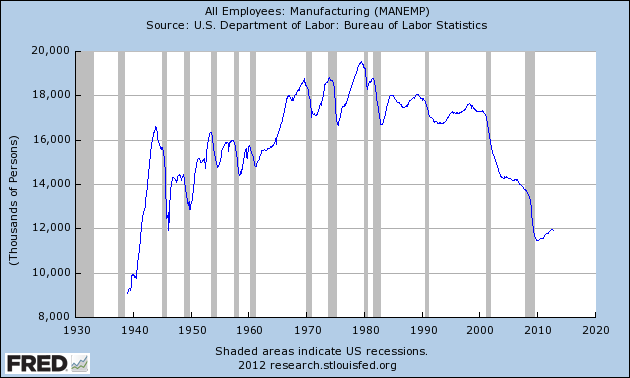 It isn’t accurate to see this as a decline of manufacturing. It is manufacturing growing more slowly than (information technology, health care, etc.). The manufacturing share of the USA economy dropped from 21% in 1980 to 18% in 1990, 15% in 2000 and 13% in 2010. Still, as previous posts show, the USA manufacturing output has grown substantially: over 300% since 1980, and 175% since 1990. The proportion of manufacturing output by the USA (for the top 10 manufacturers) has declined from 33% in 1980, 32% in 1990, 35% in 2000 to 26% in 2010. If you exclude China, the USA was 36% of the manufacturing output of these 10 countries in 1980 and 36% in 2010. China’s share grew from 7.5% to 27% during that period. The United Kingdom has seen manufacturing fall all the way to 10% of GDP, manufacturing little more than they did 15 years ago. Japan is the only other country growing manufacturing so slowly (but Japan has one of the highest proportion of GDP from manufacturing – at 20%). Japan manufactures very well actually, the costs are very high and so they have challenges but they have continued to manufacture quite a bit, even if they are not growing output much.